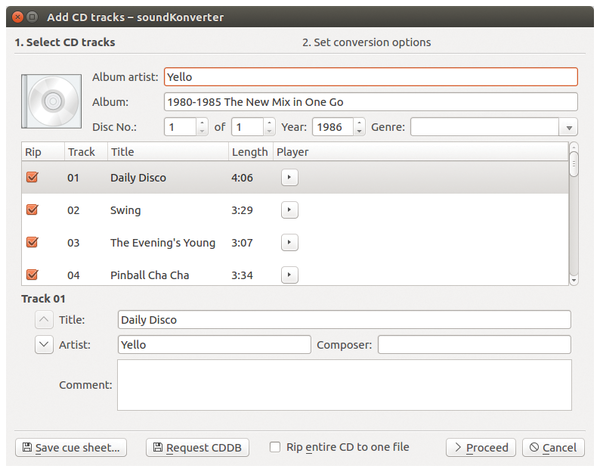 The Linux world plays host to several tools for ripping music CDs, but demanding audiophile users are often dissatisfied with the functionality of conventional rippers: Many of the tools lack important additional functions, such as automatic volume adjustment. With free programs like soundKonverter  and fre:ac , you can do everything from ripping and transcoding in a single interface. In some cases, the programs do not provide the functions directly, but instead act as graphical front ends for other audio utilities. soundKonverter has been in development for more than 10 years and is continually maintained by the project developers. soundKonverter resides in the repositories of most major Linux distributions. See the documentation for your own Linux distro for more on obtaining and installing soundKonverter in package form. Once you have installed soundKonverter, you will find the icon in the Multimedia (or Sound & Video) section of your application menu. The software comes up with a simple window featuring a large list area with information about individual tracks, a menubar at the top, a progress bar at the bottom, and a button for adding media or files. Pressing the button opens a drop-down that lets you select the source of the content you want to edit (Figure 1). You can enter a directory, a single file, an audio CD, or a URL, and you can call up a playlist in M3U format. Figure 1: The first soundKonverter window you see is simple and straightforward. Selecting an audio CD as the source medium shows the contents of the CD in a pop-up window in the form of a track list. Check the boxes under the Rip column to select the tracks you want to rip and transcode (Figure 2). A click on the Play icon beside each title starts playback. At the top of the window, enter the general metadata, such as the artist and album, and at the bottom, specify the details for each individual track. Figure 2: soundKonverter has checkboxes for selecting the tracks to be ripped. If metadata is missing, you can enter the information in the appropriate fields. After you select the desired tracks, click Proceed. The next dialog lets you define the output format, and the Detailed tab defines the quality or compression rates. You can also specify how and where to save the transcoded files and whether the software calculates a replay gain. If a replay gain tag is activated, soundKonverter automatically adjusts the volume to ensure that songs from different sources are played at the same volume. If you want to play back a mix of digital and analog recordings, replay gain reliably compensates for the considerable dynamic differences between the two technologies. After completing the configuration, a click on OK transfers the desired tracks to the primary program window. You can start the transcoder with the Start button at the bottom of the window. The progress bar and a percent activity indicator under the State column indicate the progress of the conversion (Figure 3). soundKonverter supports multithreading on state-of-the-art processors and can process several files simultaneously. Figure 3: Thanks to multithreading support, soundKonverter transcodes in parallel. If you load a file directory instead of ripping an audio CD, soundKonverter skips the dialog for defining the readable data and immediately transfers the available audio files into the specified file directory in the main window. After setting the target format and volume adjustment, begin the conversion by clicking Start. Internally, the program works with profiles that make ripping and transcoding far easier, especially for large music collections. You can access these profiles in the menu from Settings | Configure soundKonverter. The General section has some basic options for the user interface, conversion, and replay gain tool. In the User Interface area, one of the predefined profiles shows in the Default profile selection box. The settings in the Cover Art group allow the inclusion of cover images. Under Advanced, you can enter metadata for Ogg-Vorbis and FLAC files. In the Backends section, you can define which encoders and decoders are used, which program rips audio CDs, and which plugins you want to activate for volume adjustment (replay gain). Linux has a nearly unmanageable variety of command-line encoders and decoders, which can sometimes lead to incompatibilities. 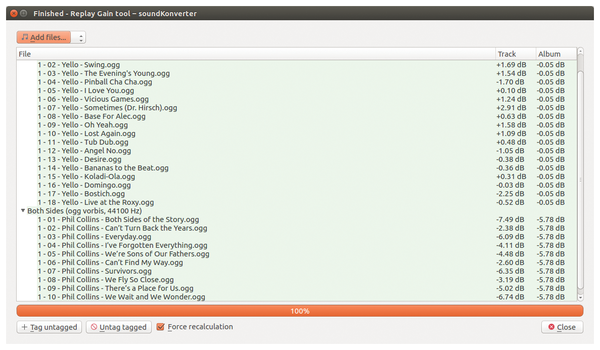 soundKonverter therefore allows you to check your selection of back ends for optimal interaction. Choose the Backends tab and click Show possible optimizations; the software checks the combination of back ends you have selected and then displays the results in a small pop-up window (Figure 4). 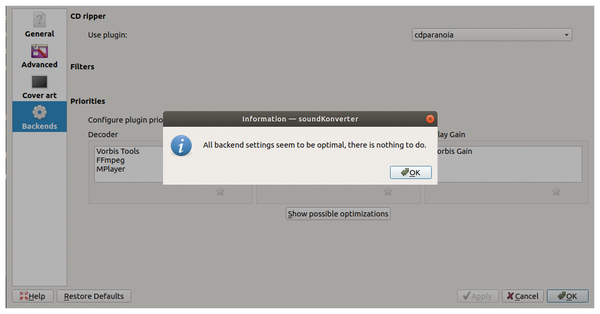 Figure 4: Checking the back-end settings in the soundKonverter Settings dialogs. If the software is not functioning as expected, call up the logfile under Conversion | View logs. Missing plugins or back ends are highlighted in red. soundKonverter also lets you adjust the volume of existing audio files in different formats. To adjust the volume, choose Tools | Replay Gain tool. In the new window, select the directory where the music files are located. soundKonverter then queries the output formats, and the module enables the formats it supports. All files then appear in a tree view in the title list. You can start the volume adjustment by clicking Force recalculation (Figure 5). Figure 5: The replay gain tool in soundKonverter lets you adjust the volume of different tracks to match. Your new media player might match your new outfit, but does it use the audio files formats you have? 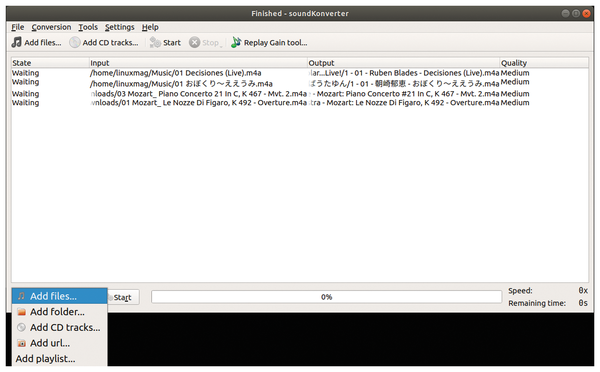 SoundKonverter helps you easily reformat your music collection. Transcode is a handy tool for manipulating video files at the command line. With its modular architecture, the Transcode utility gives users much more than simple format conversion.